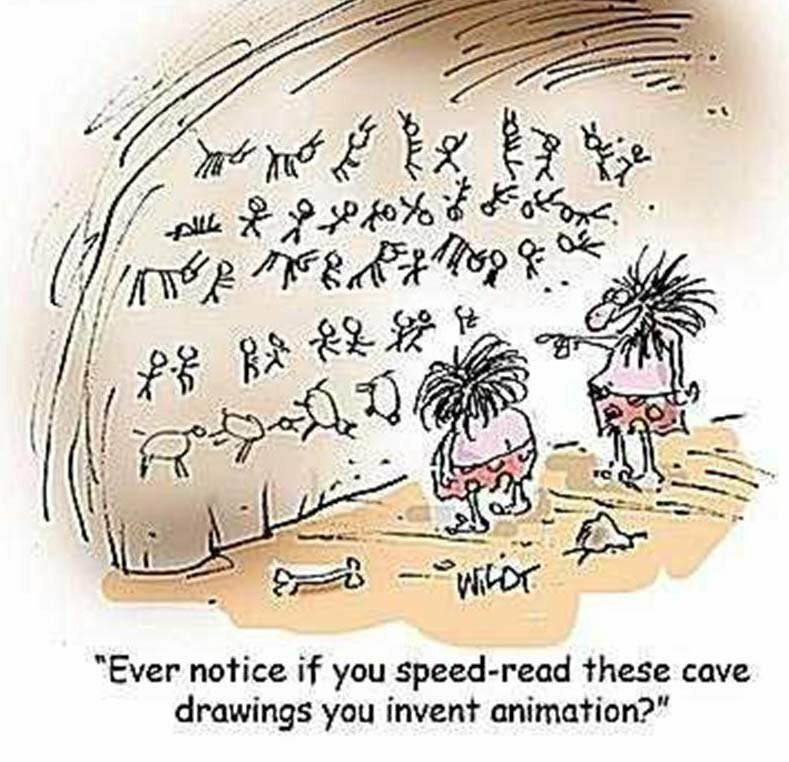 Animation—from an ancient art form to high science. Cryptic images from Paleolithic cave drawings to Shrek, the movie. I thought to tackle a much lighter topic than aging, cancer, toxic spills and malaria for a change of pace, especially since Christmas is getting closer and need some happier thoughts. Today’s blog will have less to do with biology and more into a topic of great personal interest since I was 4 years old. You may ask, “What prompted this all of a sudden?” I’ll tell ya. Blame it on Shrek. It is also a perennial surprise to me that the things we now know often have ancient beginnings. Cave dwellers of the Upper Paleolithic era (40,000-10,000 BC) began creating images of animals in motion by superimposing multiple legs. Without any means of making the images move, the drawing is not animation in the true sense of the word, yet they conveyed the human need to display motion in art. Hypotheses abound on the meanings of these cave paintings, ranging from pre-historic star charts (Dr. Michael Rappenglueck, University of Munich), spiritual trances invoking the power of nature (David Lewis-Williams), imagery of past hunting successes and rituals to improve hunting success. Considering the thousands of images painted on the walls of Lascaux alone, I think that they simply have a lot of free time and like to doodle whenever they can. Try this on your teenagers—don’t pay the Internet and cable bills, take their mobile phone away and keep them in the house. The artistic ones will be doodling all day, while the rest with no talent will find other mischief or sneak out to go shopping, which is sort like “hunting and gathering” the modern way. In fact, these ancient cave dwelling artists were so good that the painting called the “The Crossed Bison” showed perspective drawings not seen in art until the Renaissance, about 15th century AD. In 180 AD, the Chinese invented the zoetrope. It’s ok if you don’t know what it is. I did not know what it meant either until I looked it up (from Greek zoe meaning life and tropos meaning turn; the “wheel of life”). A zoetrope is a cylindrical device with vertical slits. Below the slits, inside the cylinder is a series of drawings or pictures. When you turn the cylinder while looking though the slits, the perception of motion is created. It must had been a hit in 180 AD, just like getting your first Polaroid instant camera in 1948 (called the Land camera from its inventor, Edwin H. Land, who also designed the optics for the Lockheed U-2 spy plane, later shot down by the Soviets –Sorry, can’t resist the trivia). Zooming on to modern times and for my fellow New York ‘straphangers’ who may not know, there is a linear zoetrope aptly called “Masstransiscope” built in 1980 on the subway platform at Myrtle Avenue in Brooklyn. The Masstransiscope (Sounds appropriate, doesn’t it?) consists of 228 slits set against a linear wall, behind each slit a hand painted mural is illuminated from behind. As the train runs past the station, the riders, nicknamed straphangers for holding on to the leather straps (not leather anymore, but stainless steel now) hanging from the ceiling of the train, see the images as a motion picture. Stop-motion cinematography was developed in the 19th century and the first one was attributed to George Melies, who discovered it by accident when his camera broke down while photographing a passing bus. By the time he restarted the film, a hearse was passing by after the bus. Later, he discovered that his images transformed the bus into a hearse. And so began the motion picture industry, hearse notwithstanding. Animated films of the 20th century are a bit more complicated and involved hand drawing of each frame, the second frame slightly different from the previous ones, each drawing is traced or copied into acetate sheets called “cels,” colored and photographed one by one to create the motion picture. The traditional cel animation was replaced in the 21st century with scanning and computer drawings, integrated with computer software. Despite such technological advances, the art form of traditional cel animation is preserved to this day and the input of the animators remained as it was 70 years ago. The technology has changed but the art remains blended into the new ways of creating the images. I fell in love with animation as a child living in a village far away from the city in the Philippine island of Luzon. That was in the very early 60’s when television had yet to reach the village. It was a time when a phone was a rare item and even a car passing through the village was a special event, a cause for celebration among the children who would chase the car as it sped out; must have been the same inclination that dogs have for doing the same for no reason at all. As a 4-year old, my only recollection of that period was the movie van coming to the village every 6 months after the rainy season, a much awaited event for the young and old alike. All the kids sit in front on the grounds of a dusty clearing at dusk, watching the driver/movie technician/marketing agent unfurl the wide screen attached to the outside of the van and get the movie projector going. It was the only time I can remember as a kid to be in a hurry for darkness to come. The first 30 minutes was a promotion of Darigold powdered milk. Back then in the village milk cames from some rare cows, water buffalos and nursing mothers. Darigold, a brand since 1918, is a farming cooperative of over 500 dairy farmers in the United States. Then, there was the Carnation evaporated milk promotion movie. The company, founded in 1899 by Eldridge Amos Stuart, was famous for its for its slogan of the milk coming from “Contented Cows.” The milk products and the contented cows were irrelevant to me; all the kids I knew hated drinking milk or had no chance to get any, anyway. I did not even know what ‘contented’ means; thought it was something to do with bowel movement. I was contentedly waiting for the animated cartoons of Mickey Mouse and Mighty Mouse to start. Walt Disney’s Fantasia and Snow White and the Seven Dwarfs were just pure works of wonder to me. Life was simpler then, or perhaps, life was always simpler for all 4 year olds anywhere on Planet Earth. Half a century later, animation remains an interest, though vicariously enjoyed in the guise of taking my kids to the movies. The high tech changes in animation, though visually appealing, seemed missing something. The only enduring animation that made its recent mark on me was Shrek, but only the first movie in 2001. (If you have not seen it, maybe you should go out of the cave and stop making drawings on the wall !) It was a different genre all of a sudden; a bit brash, irreverent, yet reminded me of the same qualities of the old animation films. Just like the ancient cave dwellers, each generation leaves a mark for posterity within the limits of their own technology. Our generation is leaving so much mark that we hardly notice. Perhaps, it is the generations a hundred years from now who will decide the defining marks of our generation. Shrek was an unconventional movie on its own right, but something else that struck me as unusual. I could not pin point what it was until I watched it alone, undistracted, early in the morning while I was taking a break from writing a dreary piece on malaria. And, there it was! An image of not so long ago, taking me back to the old country, an image of the Philippine flag embedded within the narrative of Shrek. I only remembered it because of the recent diplomatic flap at the US State Department when the Philippine flag was displayed incorrectly, with the side signifying the country is at war. To make this observation plausible, I think it is best to give a quick primer on the Philippine flag. This tri-color flag, whose colors were influenced by the Cuban Revolution, was first raised during the proclamation of Independence from Spain by the nascent Philippine Revolutionary government in June 12, 1898. Within the white triangle is the sun, with 8 radiating rays symbolizing the first 8 provinces that revolted against Spain, a concept similar to the Betsy Ross flag of the American Revolution with the stars representing the first 13 colonies that fought the British. In the Philippine flag, the three stars represent the three main geographic divisions of the archipelago, the red color symbolizing the blood of the revolutionaries who signed their membership to the Katipunan, a Masonic secret society, in blood; and, the blue representing peace. Among all national flags, the Philippine flag is unique because it can show a state of war by simply flying the red field on top or on the left of the observer when mounted vertically. In times of peace, the blue side is on top. The war flag was first flown in 1899 during the Philippine-American War, then again during World War II when American and Filipino troops fought and died side by side against the Japanese and during the EDSA Revolution that toppled the dictator, Ferdinand Marcos, from power. The recent diplomatic issue of the United States not being familiar with the protocol by presenting the flag on its war stance during the ASEAN summit ceremony in New York City attended by President Barack Obama last September 26th was an understandable faux pax. 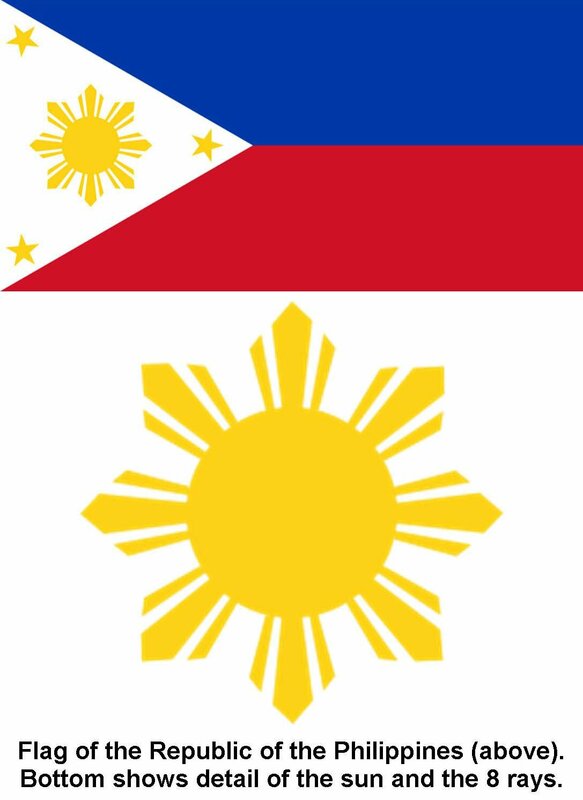 Look closely at the sun and 8 rays in the Philippine flag and then compare with the animation frame in Shrek. 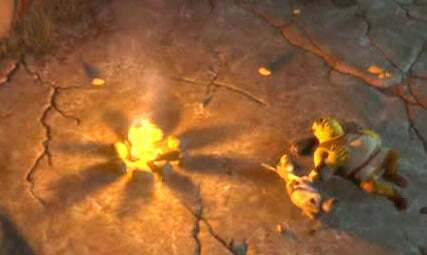 The portion of the narrative was when Fiona retired into the cave to hide from the evening darkness, Shrek and Donkey was talking about the starry night by the fireside. There were eight boulders that make up the fire pit and in one frame eight rays where radiating from the fire. In this animation frame are both characters lying down looking at the stars, with the shadows made by the rocks framing a likeness to the Philippine flag’s emblem of the sun and 8 rays. If you watch the previous scenes closely, variations of similar images appeared in different frames making this less of a chance imagery, but a more thoughful, conscious action. It could very well be just accidental and I might be simply reading too much out of this. And, I will be the first to admit that this might very well be just a happy coincidence. Or, I need more sleep and less coffee. Dreamworks SKG (the creator of Shrek), like all of the major US animated movie companies (Disney, Marvel, Hanna Barbera, Cartoon Network, Warner Brothers) all outsource their animation overseas. Over 90% of such animation companies are located in Asia. The Philippines is the dominant outsourcing location for 2D animation because for the last three decades the US animation industry has been using Filipino artists. This is because of a closer understanding by Filipinos of the American mindset, the numerous pools of talent and the lower cost compared to US animators. That those embedded Philippine emblems are attempts to merge the creative talent with national pride in a cryptic way seems plausible considering possible Filipino artist involvement in the creative process of Shrek’s animation. This is just a hypothesis and waiting for someone to prove or disprove it. Maybe Dreamworks can tell me later. Nevertheless, it is heartwarming to know that some nationalistic pride still shines out of all of this dreary work. Who knows, maybe since the animation business is moving in the direction of India and China too, perhaps there will be more artistic, cryptic and irreverent images embedded within future movies as well. Only Indian or Chinese descendants may likely spot them next time. Maybe go get your Chinese friend to check out “Kung Fu Panda” for hidden imagery.